In 1985 Rolykit developed a cosmetic box for Lanc�me France and a slightly smaller version which was succesfully used by L�Or�al and Avon Cosmetics in the U.S.A. Millions of boxes were manufactured and sold during the years and because of the timeless design of these compact boxes, the success story continued up till the late 90's where Revlon and Avon in Europe had special campaigns featuring our magic roll-up compact storage boxes filled with their cosmetics. 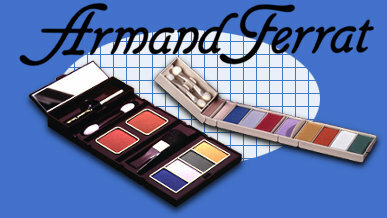 Rolykit succesfully marketed 3 models of these cosmetic boxes, exclusively as gift items, under the brand name Armand Ferrat.